In this heartbreaking and ultimately uplifting memoir, Aaron Philip, a fourteen-year-old boy with cerebral palsy, shows how he isn't defined so much by his disability as he is by his abilities. 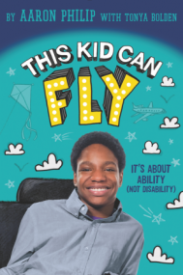 Written with award-winning author Tonya Bolden, This Kid Can Fly chronicles Aaron's extraordinary journey from happy baby in Antigua to confident teen artist in New York City. His honest, often funny stories of triumph—despite physical difficulties, poverty, and other challenges—are as inspiring as they are eye-opening. Includes photos and original illustrations from Aaron's personal collection. Fourteen-year-old Aaron Philip was born on the Caribbean island of Antigua, but the lack of resources for combating his cerebral palsy resulted in a move to New York City—and his family spending years torn between two nations. Written with loquacious simplicity, Aaron conveys a touching personal account of his numerous surgeries, therapies, and the extreme hardships endured by his family in the name of getting him the best treatments available. It is the ongoing story of a vibrant boy, born to truly remarkable and determined parents. It is also a call for heightened awareness and empathy by a passionate young advocate for others facing similar physical impairments. This memoir is accented by a smattering of black-and-white family photos—adding further weight and insight into the private lives of both this wheelchair-bound young man and his devoted caretakers. Particularly poignant was the account of all Aaron’s parents have suffered and sacrificed. This reader would have liked to see more of them through his eyes. Aaron’s voice is often boisterous and spasmodic, with a probable appeal more toward the younger range of the middle grade spectrum. Some readers may find his fixation with anime to be difficult to relate to, but there’s no doubting his exuberance over that particular interest. The particulars of his hopes, dreams, routines, and support system are uniquely insightful and undeniably valuable. The path he’s on is a hopeful one, and the challenges he’s overcome are sure to inspire. I believe Aaron’s story will find need and belonging in classrooms across the country.